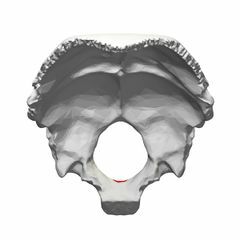 The Occipital bone is a trapezoidal-shaped bone forming the base of the skull. It is situated at the the lower and back part of the cranium. The large oval opening in the bone is called the foramen magnum through which the spinal cord exits the cranial vault.